Curly hair is very beautiful and makes you look pretty and cute. Many girls curl their hair and change their looks. But curly hair at time can be very difficult to tame. Even after you apply strongest gels on your curly hair, you may find it a difficult task to manage the curls. So, many girls with curly hair wish to change their look by straightening their hair. Straight hair is the fashion nowadays and this makes many women to straighten their hair and go along with the trend. You can also try it. Most of you refrain from straightening curly hair thinking that it may damage you hair. You need not worry. By following the correct technique, equipment and method, you can have straight and beautiful hair without doing much damage to your hair. Here are given some methods, which you can try to straighten your hair without causing damage to hair. Use of coconut milk is a natural way to straighten your hair. This keeps your hair well nourished and does not cause any damage to your hair. Grate coconut and take its milk. Pour one cup of this coconut milk into a bowl. Squeeze half of a lemon and add its juice to the coconut milk. Now you have to put this mixture in the fridge for one hour. After an hour, take it out and apply it n your hair, taking care that it covers your hair fully. Take a towel and heat it for a few minutes using a dryer. Wrap your head with this towel. This way your hair will be able to absorb all the nutrients present in coconut milk. Wait for 35 to 50 minutes and then wash your hair. Take one cup of milk in a bowl and add honey to the milk. Mix both the ingredients well so that you get a good paste. To make this paste more thick and work better, you can add banana to it. Bananas act as good moisturizers and keep your hair well hydrated. Apply this paste on your hair and let it remain on your hair for 1 hour or more. This will allow the mixture to work well on hair. You can wait till the paste becomes fully dry on your hair. Wash your hair with a good quality shampoo. Milk is amazing for curly hair and works like a miracle for your curly hair. Pour milk into an old spray bottle. Spray the milk on your dry hair. Now you have to wait for 20 to 30 seconds, so that the milk can work on your hair well. Using olive oil is a natural way to straighten your hair. 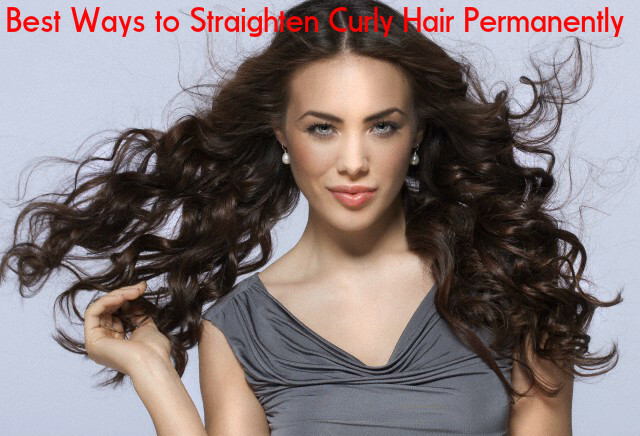 It is found to be very effective if you want to straighten your curly hair without causing any damage to your hair. Take two eggs and break them into a bowl. Now you can add suitable amount of olive oil to the beaten egg. Apply this mixture on your hair, taking care that it covers your hair thoroughly. Let it remain on your hair for about 45 minutes, so that it can work well on your hair. You will not get an immediate result by using this method. But if you apply this at least 2 or three times a week, you will start getting positive results after about a month. For straightening you hair with iron, you have to use a good quality straightening iron and be very careful when you do the process. This way you can do it without causing much damage to your hair. One of the most important things that you must remember when you use straightening iron is its temperature. A good quality iron has options to adjust its temperature, so that you can adjust it properly. The temperature of the iron must be adjusted according to the type of your hair. If you have fine or slightly damaged hair, then the temperature of the iron can be from 250 to 350 degree F. For hair that is of average thickness, the temperature can be between 300 to 350 degree F. Follow the simple steps mentioned below and straighten your hair with a straightening iron. Wash your hair well and blow-dry your hair. Now take a heat protection spray and apply it on your dried hair. Divide your hair properly into many small sections and layers. Now heat your straightening iron to the correct temperature. You can start straightening your hair. Begin with the lowest layer, which is just above your neck. Stop immediately if you see your hair start to sizzle. After you have finished using the iron, look in to the mirror and make sure that you have not missed out any section or layer of your hair. Once you complete the straightening, apply a good quality finishing product on your hair. It can be a hair spray or a fixer. So, these are a few ways to straighten your hair. Straightening iron is commonly used to straighten hair. However, the other four methods are homemade methods, which are natural and very effective. You will not experience any side effects on your hair using them. Rosemary Oil for Hair Growth – Benefits and How to use? These tips are great. I like this post. I’m glad that I found this post.